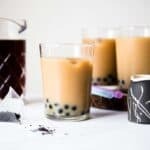 I used Chinese breakfast tea for my bubble tea recipe, but any other black tea or strong tasting green teas will also work! In the recipe, you may notice that I use 8 tea bags to steep just 4 cups of water. Because the tea will be watered down with milk and ice cubes, you want to start of with a pretty strong tasting tea. If you enjoy a lot of tapioca pearls in your drinks, I recommend cooking 1 cup of tapioca pearls instead of the 3/4 cup I listed below. You will likely have a lot of simple syrup left over, which you can use for other drinks, such as lemonade. For my version of the Jasmine Green Bubble Tea, check out my recipe on Numi’s blog!